Located at the mouth of Pack Creek on the eastern shore of Admiralty Island about 30 miles south of Juneau, Alaska, Stan Price State Wildlife Sanctuary provides protected habitat for brown bears while affording visitors an opportunity to view and photograph bears close-up. The sanctuary is cooperatively managed by the Alaska Department of Fish & Game and the U.S. Forest Service to provide bear viewing opportunities with minimal impact to brown bears. Pack Creek permits are now available online through Recreation.gov or their toll free number 1-877-444-6777. 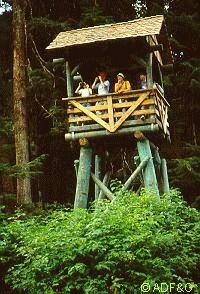 Access permits must be obtained through this service provider or through one of	the approved guiding companies. For additional information about visiting Pack Creek, see Tips for Visitors, and Charters & Guides, or Admiralty National Monument. 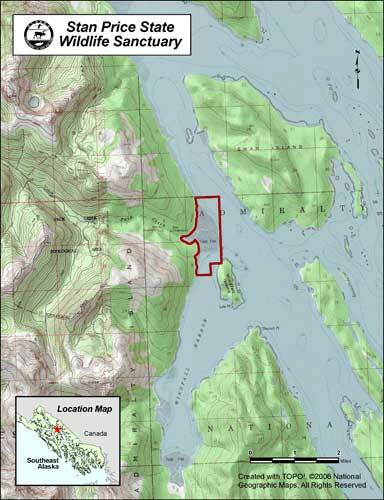 For current land status information, see the Stan Price Land Status Map (PDF 349 kB). You may also download the KML file which depicts the refuge area boundary.